This is the second post on the Wake Forest futures. 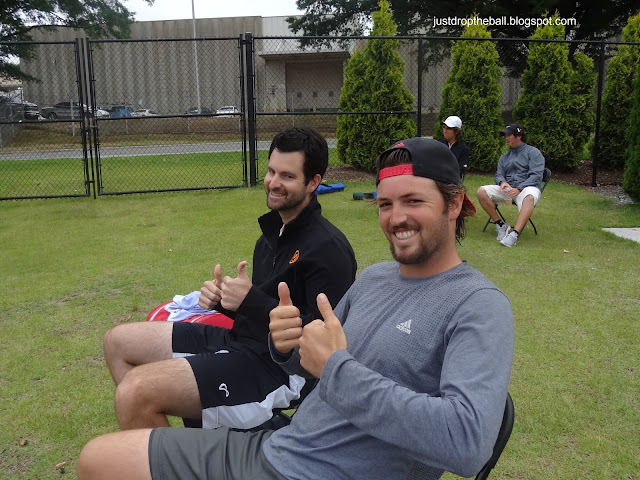 ICYM the first one: My First Futures Experience at $15K Winston-Salem. They had chairs this time, first come first serve. Three courts in action on the left and one on the right for the second round matches. A cool and breezy day. The best thing about attending futures (and challengers) is getting to see the players up close. Smaller crowd makes it easier to spot and interact with the athletes Also, they are free of charge most of the time. 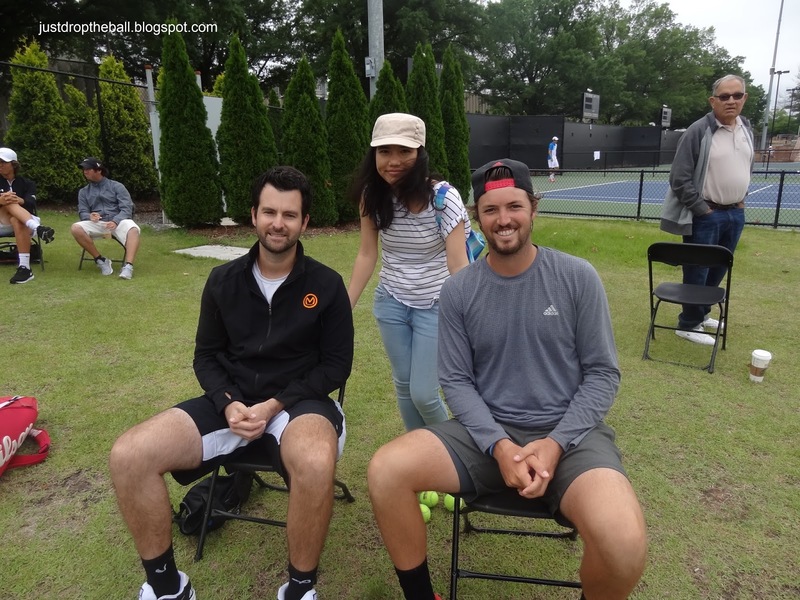 The largest crowd was at the Rubin and Sandgren match. Tennys won the duel 7-5 6-3. 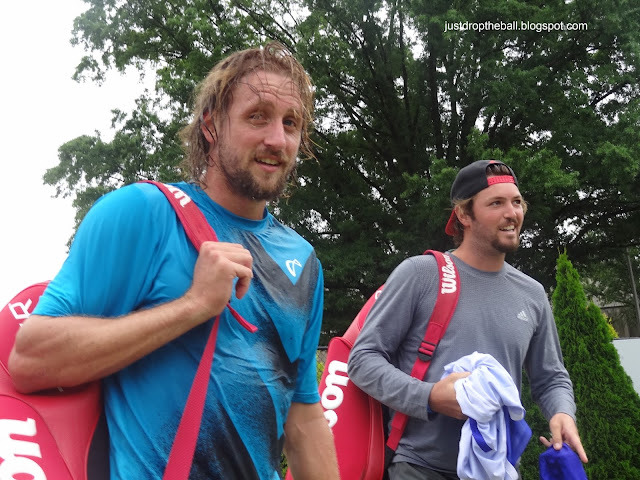 Matija Pecotic of Croatia and Mac Styslinger had a LONG but friendly conversation after their match. Both players smiled a lot. The lefty top seed played very well; he defeated his opponent 6-3 6-1. Sekou Bangoura defeated UVA's Thai Kwiatkowski 6-3 7-6(9). On court 3, American Mico Santiago defeated India's Sanam Singh in the 3rd set tiebreak. The most dramatic match of the day belonged to Hunter Nicholas and Ernesto Escobedo. Hunter served for the first set at 5-2 but Ernesto broke back twice to force a tiebreak. Frustrated, Hunter lost control of his emotions and started abusing his racket, towel, fence, and the balls. Profanities and code violations were flying. But he wasn't the only one upset. Ernesto also received a code violation for ball abuse after disputing a line call on SP in the tiebreak. HN's tantrums continued throughout the match. 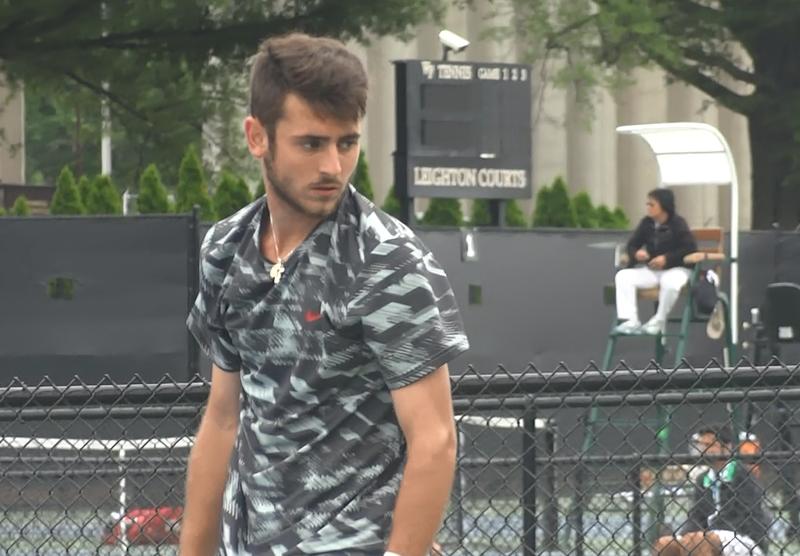 After slamming a racket at his chair during changeover, the umpire awarded the final game to his young opponent to make the final score 6-7(6) 7-5 6-2. Former Georgia Tech Yellow Jacket, Kevin King took out Wake Forest's Jonathan Ho 6-1 7-6(4). Looking straight ahead, WF football stadium. On the right, WS futures' playing courts. Future ATP Winston-Salem stadium court (currently fenced). Looking back, the Wake Forest Indoor Tennis Center housing locker rooms and players' lounge. On the left side, they are constructing permanent seating facility ahead of the Winston-Salem Open. Before I left, noticed that Brian drove off in a different vehicle instead of riding with Rhyne and Tennys. Then I remembered he told me the other day, his brother lives in Durham so maybe he is staying there for the week. And that concludes this post. Thanks for reading. A reminder, check the ITF tournament page for the scores and updated draws.